1. Mix the marinade ingredients together in a non-metallic bowl, add the chicken, stir and marinate for at least 30 minutes or for as long as possible. Cover and put in the fridge, if you have the time to leave it longer. Bring back to room temperature before cooking. 2. Heat the oil in a large non-stick pan and add the whole spices and turmeric, give the pan a good stir and add the onion, green chillies and salt. Fry for about 6 minutes until the onions are golden. Add the chicken along with the marinade and the water. Turn the heat up and bring to the boil, then simmer, covered, over a lowish heat for about 25-35 minutes, depending on the size of the joints, until the chicken is tender, stirring every now and then. Add a splash of water if the pan is getting dry at any stage. Stir in the coconut and almonds, and cook, uncovered, for another 3 minutes until the gravy is creamy. 3. 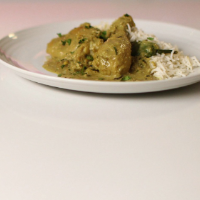 Add the garam masala, sugar and fresh coriander, stir in the cream, taste and adjust seasoning. Serve with rice or roti. This recipe was first published in Tue Jul 23 09:22:15 BST 2013.